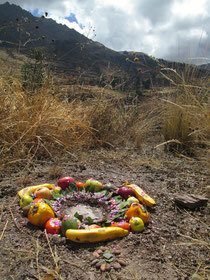 Offerings have been part of human spiritual practice for thousands of years. They are reminiscent of a time when humans had a deeper connection to and awareness of the cycles of the universe and the seasonal changes in the land. Dependent on localized agriculture, time was taken in the community to foster a close relationship with the land and in honouring the sun, moon and earth for their irreplaceable power to provide sustenance and medicine for our fragile bodies. In Daoism, as in many ancient cultures, there is an idea of maintaining balance. As with all relationships, the flow of energy in only one direction leads to disharmony. In failing to acknowledge gifts from the earth with humility and gratitude we allow instability to arise into the universe. The ancient practices to remedy this imbalance such as crafting an object from wood or metal, collecting grains and fruits, binding them with a song or prayer into the land, are almost forgotten. Yet this is in our power to change. The art of making offerings can be recalled. In each of us is the knowledge and creativity to revive and recreate these rituals. Kneel down, touch your hands into the soil and say thank you. Take time to nurture that which nurtures us. Make something, gift it to the universe. Sing a song to the land, make a prayer. Dance in bare feet and offer your dance. Make known your wishes. Gather things of value, offer them as thanks. Maintain the balance. The universe will be grateful.